I’ve been throwing my efforts today into trying to finish the renovations in our bedroom and have spent hours up the ladder preparing the cornice for painting – hopefully this is almost the last stage. As a result all yesterday’s ideas of starting a new piece of artwork were put on hold for now. 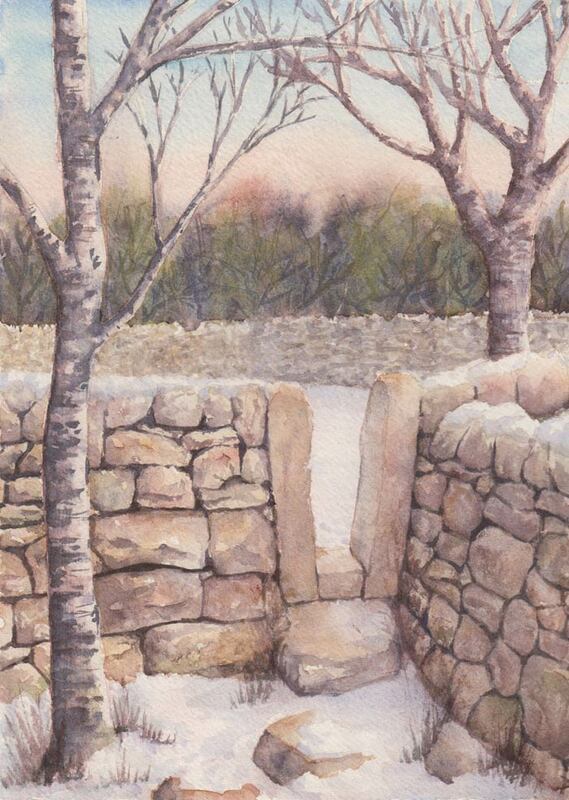 Instead I finished off the dry stone wall seen here. 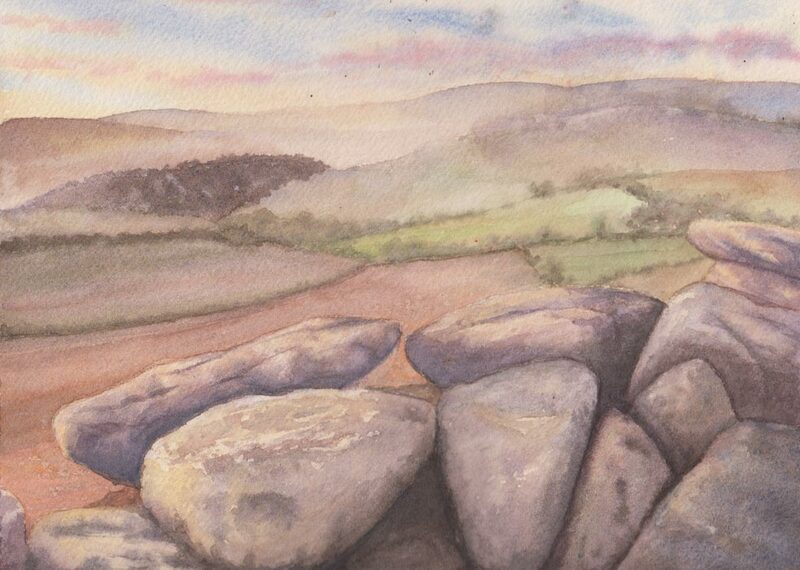 The practice of the weekend has definitely had a positive effect as I settled into it really quickly and I reckon these last few stones are much better than the earlier ones – typical to just get it right as it’s finished 😛 – I managed some lovely dry brush strokes on one of the rocks (3 cheers for less water!). Tomorrow I’m off to do my stint at the PCA Gallery so I won’t have much time for painting again… maybe I’ll try doing something on the train again. The first few stones are in and looking good… I may have got them a bit too dark at the bottom of the picture, but they’re supposed to be in deep shadow so I’ll reserve judgement until the rest are complete. Maybe it’ll balance out when they’re all finished. I’ve also done some research today, and a bit of sketching, towards a possible composition for tomorrow’s exercise as there’s a call out from a nearby gallery for works that have been inspired by music. I’m not really expecting to be able to complete something worthy of hanging within a day (the deadline is Monday! ), however, I like a challenge and it’s an interesting subject so lets see how it goes :-). Another hour on the background today and I’m still pleased with how it’s going – that has to be a first for this week 🙂 I’m trying desperately hard not to fiddle, to get the right colours first time and be confident with them, to plan my brush strokes carefully… Not every one has worked but mostly it’s better. I’m still looking forward to the stones – I think this will be tomorrow’s session – but I’m also just a little bit apprehensive too. It would be so easy to get jittery now and this is exactly where my technique needs to be strong and confident. Over the past day or so I’ve been wondering what I can do to loosen up and paint more freely. I actually came across some very good tips in a timely newsletter from the Artist Daily website called Proven Steps of Watercolour Painting Mastery. The first one was load your brush and paint a sure stroke to avoid looking like you’ve overworked. 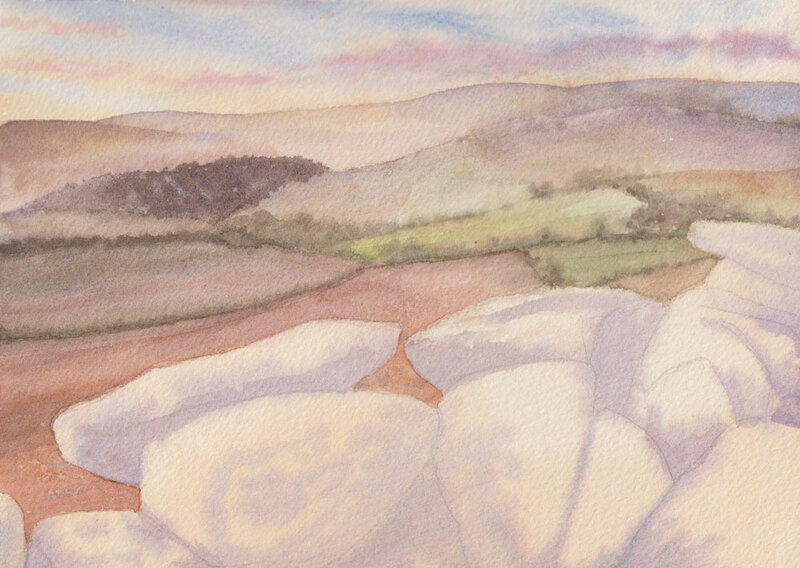 With this in mind I started a new piece to try it out… maybe a sunset wasn’t the best idea, especially one with such delicate tones, however I did manage to get some initial washes on without too much fiddling. 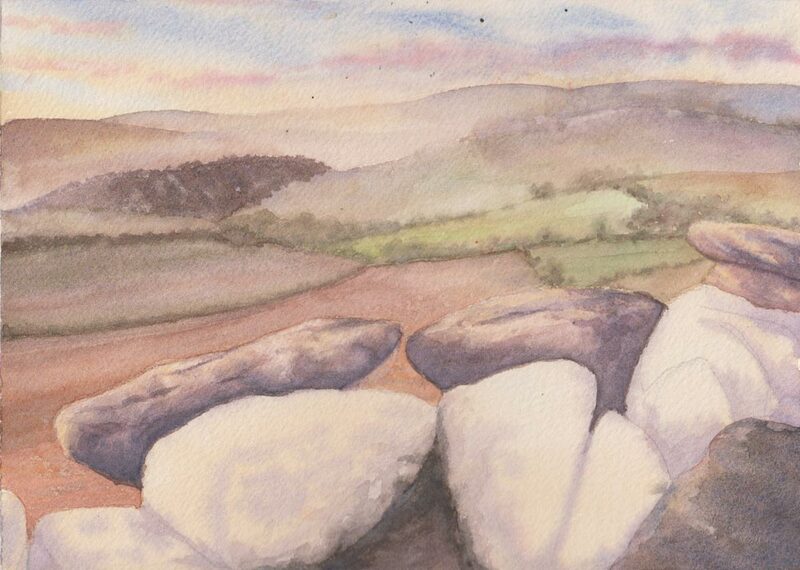 I’m looking forward to playing with the stone wall in the foreground, and less excited about the fields in the mid ground – great potential for getting lost there! I think I might have to try out their second piece of advice too, which was to try working abstract – to give up control to gain insight and discover what effects can be achieved. This will hopefully give me back some much needed confidence regarding colour and water ratios, I’m really struggling in this area at the moment and every stroke is either far too wet or much too dry, and mostly without enough pigment in either case. I think it’s back to practising scales for a while, as it were. Just a few more steps have brought this painting to a stage where I think I can now comfortably leave it. Apologies to all my friends in the UK who are sick of the sight of snow, I’ll try and steer away from it as a subject for a while. I can’t promise how long it will be though… I have already been tempted by some great snowy photos that a friend has taken in rural North Wales.